With a very large number of paintings, drawings, ship models, sculpture and scrimshaw on display, the J. Russell Jinishian Gallery, located at 1899 Bronson Road in Fairfield, CT, is the nation’s foremost gallery of fine marine and sporting art. While the inventory is indeed spectacular, it’s the knowledge and enthusiasm of the affable owner, America’s leading authority on contemporary marine art, that makes this gallery a truly amazing place. The J. Russell Jinishian Gallery proudly represents the world’s finest marine artists. “We’ve become a unique little place, and we’ve gotten to know each other over these 30 years – artists, customers and customers’ kids,” says Russell. “You can’t go anywhere else in the country and see work by all the top marine artists from around the world. I really enjoy the relationships with them and my customers. People buy these pictures because they like to look at them. The artists paint them because they’re interested in and extremely knowledgeable about their subject matter, and that creates a nice equation. If somebody buys a work of art – whether it’s a painting, scrimshaw or a ship model – they get something that they can enjoy. In turn, they’re helping support an artist in their creative endeavor, which is a pretty rough, uncertain lifestyle. That exchange is a very positive thing. And because I have very close relationships with the artists, I get things that other galleries may not get. Sometimes you’ll see a painting here that no one else has seen except the artist and his wife.” The gallery also represents sporting artists who specialize in fishing and hunting art. “Fred Polhemus, who worked with me at Mystic Seaport, runs that part of the business,” Russell explains. “Marine art is now a worldwide artform, and there are marine art societies all over the world,” says Russell, who is an honorary member of the American Society of Marine Artists who sits on the Advisory Board of the National Maritime Historical Society. He lectures nationally on marine art and collecting, and is a frequent contributor to WindCheck on those subjects. 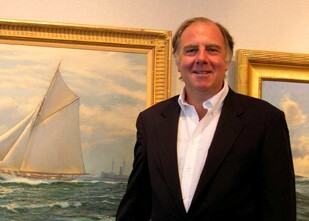 He’s the author of Bound for Blue Water, the definitive guide to contemporary marine art, and he publishes Marine Art News, a beautifully produced magazine with information about artists’ techniques and what they’re currently working on, upcoming exhibitions and auctions, book reviews, and recent sale prices for all types of art and collectibles including classic automobiles, antique firearms, jewelry, Hollywood and sports memorabilia, and more.